REITs have been under pressure the last few months as interests rates have ticked up on the expectations of a fed funds rate hike later this year. The triple net lease sub-sector has been particularly hard hit since their leases are typically longer term and act more like bonds. 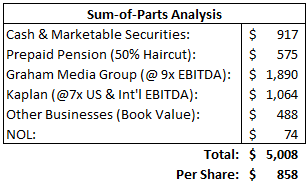 With Gramercy's July 2016 ($36 minus any dividends paid) incentive agreement looking more out of reach, and equity raises off the table as a result of the stock's slide, management seems to be switching to plan B and unfortunately moving away from their bread and butter industrial focus. 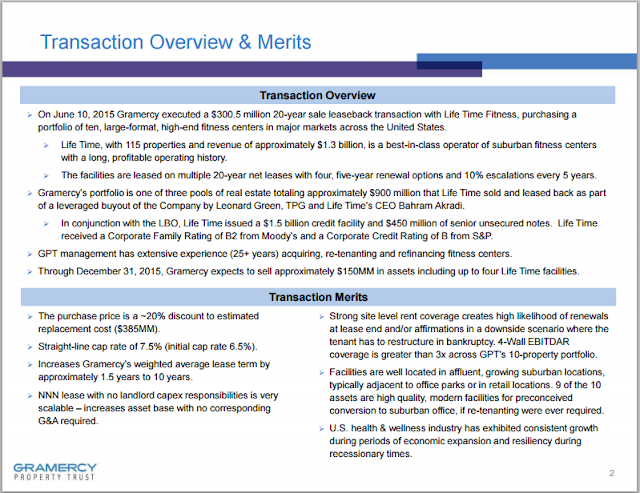 The first move away from the original industrial focus plan was the early June acquisition of 10 Life Time Fitness facilities as part of Life Time's private equity buyout which was in response to activist pressure to either sell the company's real estate or do a REIT conversion. Fitness clubs, which Gramercy is classifying as "specialty retail", are notoriously difficult businesses with increased competition coming into the space from the likes of SoulCycle and CrossFit style offerings. These are big box facilities in suburban locations that would take significant capex to repurpose into an office building. Doesn't seem like an attractive enough deal to move off message for? With a straight line cap rate of 7.5%, its only relatively neutral compared to where they raised significant capital earlier this year, maybe a slight positive with the operating leverage gained. A former private REIT, then known as CB Richard Ellis Realty Trust, Chambers Street has been a disappointment since entering the public markets in 2013. The incentives of the private REIT world encourage management to grow assets quickly (and collect fees) at almost any cost and sell these investments to unsophisticated retail investors looking for monthly dividends (similar to the shareholder bases of mREITs and BDCs). The result tends to be an unfocused mess of a portfolio with many lower quality assets. On 7/1/15, Gramercy announced a "merger of equals" with Chambers Street where Chambers Street will actually be the one acquiring Gramercy, but will change its name to Gramercy Property Trust and use the GPT ticker after the transaction. The Gramercy management team will run the show at the new combine entity (Chambers Street was previously without permanent CEO) and waived the change of control provision in their incentive agreement. 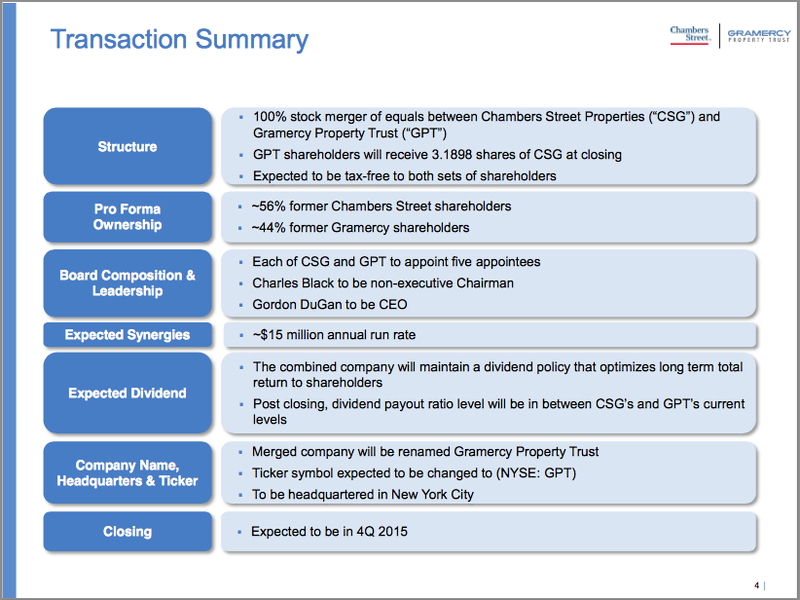 Chambers Street and Gramercy have different shareholder bases, CSG shareholders revolted at the thought of their monthly dividend being cut without a sense of the bigger picture and as a result dragged down GPT with it due to the proposed all stock transaction. 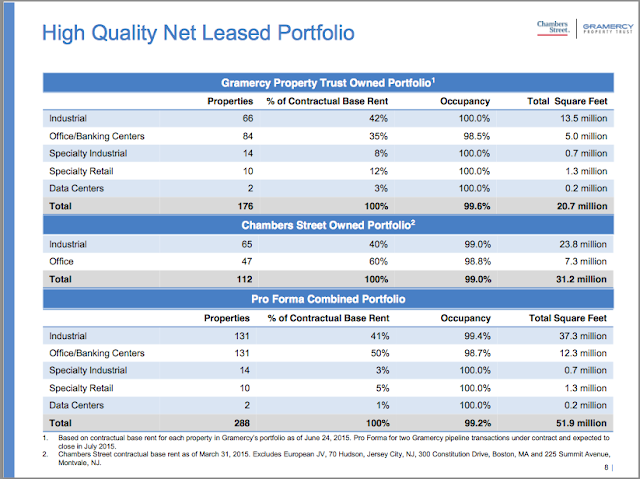 Gramercy's asset management business has always seemed overstaffed compared to their revenue on the KBS contract, DuGan found a way to utilize this large team with CSG that has previously been working down the BofA bank branch portfolio over the past two years. Gramercy plans to sell between $500-$700 million worth of the office properties (hopefully the multi-tenant ones) over the first year and reinvest that capital into their (previous) industrial focus. The Chambers Street portfolio also includes some European assets that potentially moves up the timeline for listing that vehicle. Overall, not entirely excited about this transaction, but it makes sense given the current REIT landscape and the mid-$30s share price goal a year from now. Think of this transaction more of a backdoor capital raise in buying a scattered cheap net lease portfolio that they have staffing to work down and reinvest in properties they otherwise would have needed to access the capital markets at uneconomic levels to purchase. My back of the envelope math shows Gramercy currently trading at 11-12x core FFO, too cheap for a management team that has until 6-8 weeks ago delivered on nearly every promise they made since the beginning in 2012.